The Only True 'Universal' Bond! Bonding So Strong, It Can't Be Broken! Why Is Tokuyama Universal Bond So Strong? The silane bonding agent in single bottle bonds is prone to rapid degradation because of acid also in the mix (according to the University of Leuven in Belgium*). In this situation, a reliable bond cannot be achieved without fresh silane. Tokuyama Universal Bond stores acid and silane in different bottles to ensure fresh silane at the time of use giving a consistent, reliable bond. Even so self-curing Tokuyama Universal Bond is quicker and easier to use even with two bottles. 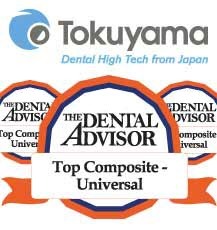 Tokuyama Universal Bond primary component is a newly formulated, patented monomer, that has more bonding “arms” giving a stronger bond and enabling it to bond to Zirconia. Other added monomers are specifically non-precious metals, glass ceramic or oxide ceramics. hydrofluoric acid etc. Tokuyama Universal Bond is fully compatible with all materials both dual and self cure materials without additional activator. Tokuyama Universal Bond is truly universal even for repairs. Speed comparison with other brands! Universal Bond Holding A 135lb Weight!